her we had a really successful, bountiful garden! 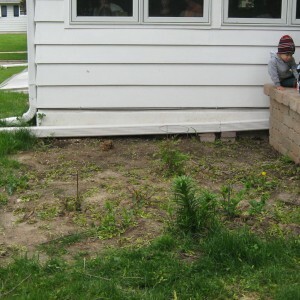 I was very excited to plant my first vegetable garden this summer with my two and a half year-old daughter. I thought it would be a great experience for her and would give us some tasty, healthy, organic veggies. She might even be more inclined to eat them, considering she grew them herself. We didn’t have a large budget due to other household projects this year. I had planned on using a small raised bed my husband had put in years ago for a rose garden and then a tomato garden. He didn’t have much luck with either. I had an additional challenge, since that bed was in clear site of my neighbor’s yard where they were planning to hold a wedding later in the summer. I wanted a “pretty” vegetable garden that would be a fun experience for my daughter and me to share and would give us some tasty veggies too. Oh, and it had to fit in that small bed, since we didn’t have another area of our yard that was suitable. Using some impressive creative skills, as well as her own experience and knowledge, Heather did such a great job planning a garden for us that worked on all fronts. 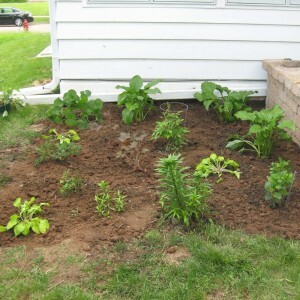 It was a vegetable garden with some annual flowers and hearty rose bushes mixed in. The thought of mixing vegetables and flowers never occurred to me. Climbing vegetables would cover four decorative trellises, two of which we already owned. She recommended putting our tomatoes in pots we already had on our back deck where there was more sun. We couldn’t wait to get planting. With some assistance from Heather, my daughter and I planted the garden, watered and waited. It was very exciting to see the first plants sprouting up and has been even more exciting to see the vegetables growing. We are now enjoying the fruits of our labor and the wedding guests are soon to enjoy the beauty of our garden as well. My neighbor is very pleased. We are very pleased and very excited to do it again next year. Please make this a garden! Thank you so much for all your hard work. The garden is soooooo beautiful!! I get excited every time I look at it, and it puts a smile on my face!! My work days have been long and looking at my little garden soothes my nerves. You are so talented! Thank you again. My son wanted to set up a garden, and I really struggled with the best way to do this. I knew some of the basics, but that wasn’t nearly enough . . . I wanted to start small, and I wanted to do this in an environmentally friendly way. Heather gave me exactly the help I needed in setting up the garden. Heather knew exactly what to do, and I am thrilled with the results. I was looking for a beginner’s garden that I could share with my son, and within my budget too, and she tailored this perfectly. I will definitely call on Heather again when it comes to my next gardening project.